Okay! Musume Time: Morning Musume: 10th Gen Finalists Revealed! It has finally been revealed just who the Morning Musume 10th Generation Audition Finalists are, and in all honesty - I found out by accident. Why? Because my friend sent me a link to the latest Bijou Gaku, and through boredom and lack of subs, I skipped straight to the end - AND FOUND THE HOLY GRAIL!!!! 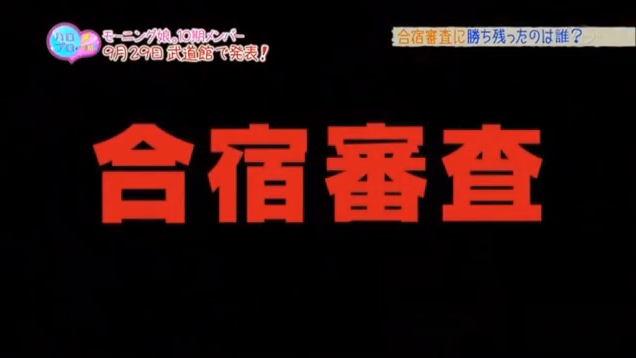 Previously, we saw this scene in the latest Bijou Gaku, and it has returned - but who shall we see now in the finals? Luckily, we have 10 of them. Yes, 10 whole finalists - and they're better than I thought they would be, because in all honesty, look at S/mileage right now - only Akari and Rena can sing really, and though I LOVE Kanananana and Fuu-chan, even I know they can't sing. 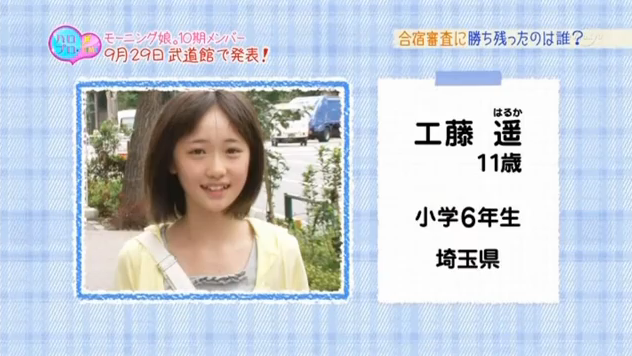 Kudou Haruka, from Saitama Prefecture. 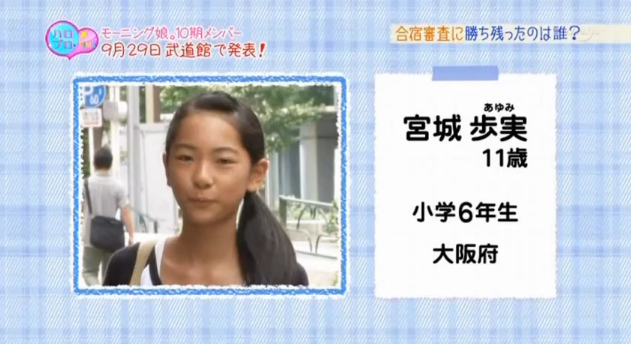 Kudou is one of the youngest at the age of 11, though despite this, she actually looks just a tiny bit older than she is. She is a very cute girl, and when I first saw I thought 'I like her, be my favourite, LOVE LOVE LOVE' and yeah, I like her. 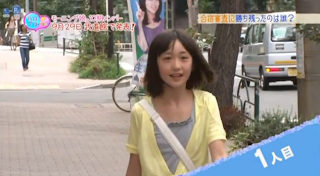 Her audition song was Seishun Collection, and boy does this girl have a strong voice! She is pretty darned good. I have no clue what her dancing skills are like yet, but hopefully during the training camp, we will get to see them soon! PS, she is an egg - I thought I recognised her somewhere! YAY EGGY! Ikubo Haruna, from Tokyo and 16 years old. 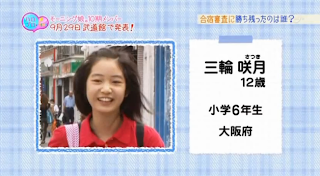 Ikubo is the oldest finalist to get through, and really reminds me of Koharu when she smiles. Her voice isn't bad, it's actually really cute, but she can sing - thankfully. I really like her as well, so I will be rooting for this girl. I want an older member in Morning Musume, someone closer to Mitsui's age - we haven't had that since 6th Gen (Fujimoto Miki, though I have never classed her as a true Morning Musume member... dunno why ;/) and it would be nice to close the age gap. She's also very cute, and I really like her smile. Satou Masaki, from Hokkaido. Saki is 12 years old, and I have already dubbed her as 'The Beautiful Tomboy' - I would love to see another boyish figure within Morning Musume, because we haven't had one since Yossie left, and though I was never around to see the Yossie era, I would like to see a boyish character again and for Tsunku to make a song where a girl plays as a boy. I think that Satou is quite beautiful for her age, and her smile is absolute love - her voice, however, is not the strongest, however I can see her in Morning Musume, but I also think that it might take her some time to shine. I dub her as 'The MoMosu you want to root for!' Girl! Tashima Meru, from Fukuoka (YANKEE!) 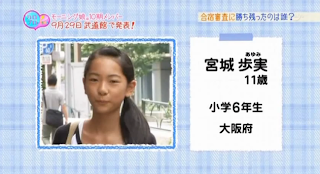 and 11 years old, making her another young one to add to the plate ;o Tashima looks like a tomboy as well, and is quite cute, but I have a feeling she will be the Under Dog of the auditions. Her voice isn't bad, but it is not the best either - she isn't painful to listen to, there is just this weirdness to her voice. Like when you listen to Ikuta (I love her, seriously, IKUPON!) I guess. Anyway, I actually can't see Tashima in Morning Musume right now. She doesn't have this idol spark about her yet, but if she does make the team, then she might just be a great addition - you never know. I mean, how many people were skeptical about Ikuta (I wasn't, I thought she would make it - she did) and yet she is a big personality for MoMosu now! Anyway I put her in 'The Under Dog you want to win, for some reason!' category! Miyagi Ayumi, from Osaka. Another 11 year old, but she's quite tall and mature-looking for her age, and very tan! I want a tan Morning Musume member, okay? Maybe a Gyaru one too? Okay, whatever, this girl is better at dancing than she is at singing, because her voice is a bit weird, but training could fix that. I would also like to note that during her dance in the auditions, she seemed extremely happy, and I really like that. 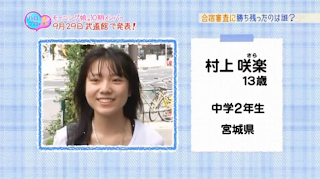 I personally would like to see this girl in Morning Musume, but I'm not desperate for her to be in. I don't see an Idol like aura to her yet, but it could certainly come in time. She looks like a friendly girl, and I am anticipating how she does at the auditions. 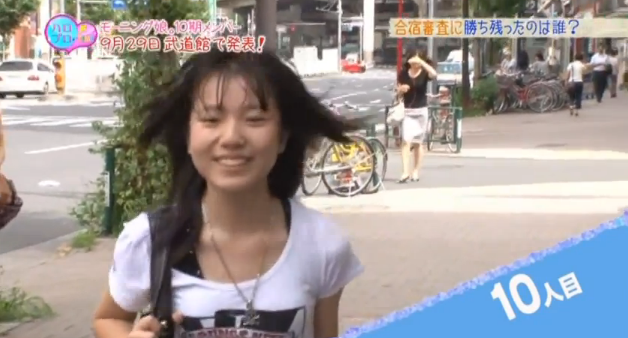 I will tag you as 'The Genki smiling girl!" Ichida Ayumi, from Miyagi Prefecture. 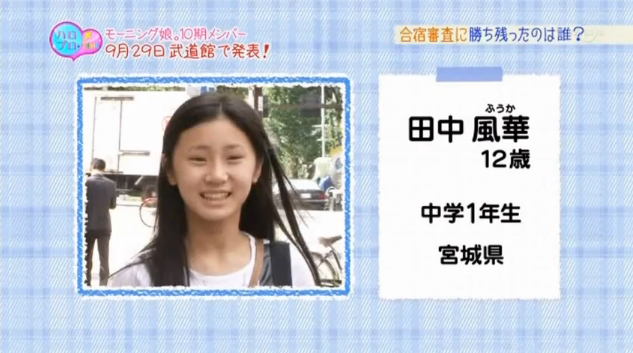 The second oldest of the auditionees, Ichida is 14 years old, and quite a beautiful young girl. She looks a little younger than 14, to be honest, but she still has an appealing look to her. It seems that her strong point would be dancing, but she is also quite good at singing, as she has a powerful voice (always good for concerts) and she has a strong presence about her. 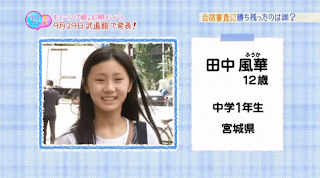 I think that this girl might be a perfect fit for Morning Musume, but that is just my opinion. She is quirky, and seems to be less shy than the others. I anticipate her performance during the training camp period, because this girl shines quite a bit. Tanaka Fuuka, from Miyagi Prefecture. Tanaka is 12 years old. This girl is an energetic dancer, and she has some nice legs on her, too! For her audition song, she sang Maji Desu Ka Ska, and sang it in a cute voice - her singing isn't bad, and she has some good pitching, and she also doesn't look boring when singing, so yay, bonus! I think that she is a cute girl, but I don't know about how she would fit into Morning Musume - she would probably make a really good idol - however, there is already a Tanaka in Morning Musume... I don't think we need another one!!! But maybe she would be a good addition? Who knows? 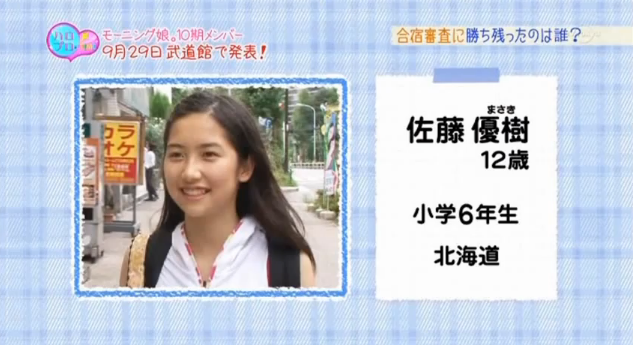 Murakami Sara, the 10th Finalist from Miyagi Prefecture (DAMN they keep comin'!). Murakami is 13 years old and the final finalist out of all the girls, and as people say - save the best till last, because this girl is a power house! Okay, maybe not power house, but out of all the finalists she has the best voice and the best control. Her voice is quite mature, and definitely a pleasure to listen to. I am excited for Sara the most, because she has the highest level in singing, and stands out from the rest. 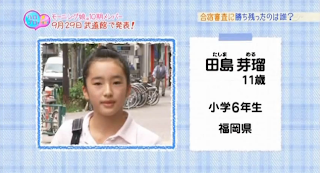 She has an interesting look about her, and I think that she would make a nice addition to Morning Musume. If anything, I definitely want this girl in. But first, I want to see how she moves! And so that is all the finalists for you! I am very happy with this pick - there are 10 girls here with different looks and different personalities, so I think that there is a favourite for everyone. Personally, my favourites are Haruka, Haruna, Ayumi, Fuuka and Sara. These girls stand out to me the most, mostly because of how they presented themselves during the auditions. When I watch the Boot camp, I may change my opinion, but right now, Ii really like the look of these girls - especially Haruna and Ayumi, they shine the most for me. I am also extremely happy to see an egg within the audition finale, and it would be nice if she actually got in - Haruka is a very cute girl, with a really good voice, so I would love to see another Egg in Morning Musume. Sadly... Karin did not get in - even though I'm not a fan of her, that girl can SING!!! Anyway, I hope this update has somewhat pleased you all, because it pleased me! I hope you all have a nice day/night! So, who are your favourites?